The Atlanta Braves started a new chapter in 2017 as they officially moved from Turner Field to the newly constructed SunTrust Park. Turner Field, which was their home for nearly 20 years and host to the 1996 Olympics, was relatively new at just 20 years of age. However, it would require nearly $350 million for renovations and fan improvements if the Braves decided to maintain their lease. In order to compete with other stadiums with popular fan destinations, including shopping and entertainment facilities – along with increased parking and a better location – the Braves chose to move forward with construction of the new stadium. 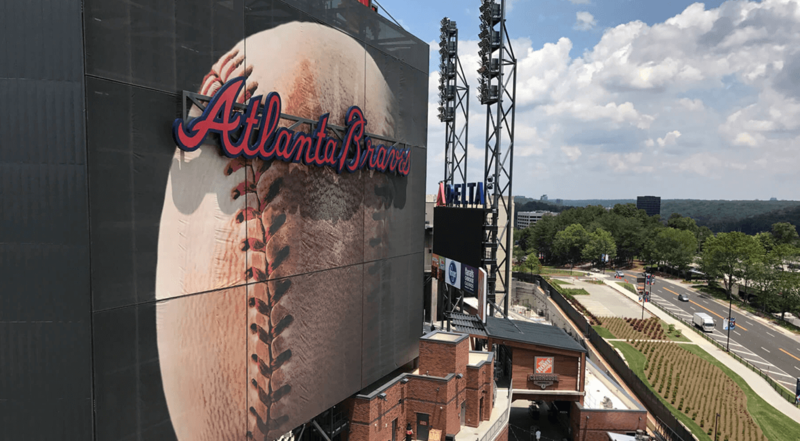 With a projected cost of $672 million, Populous, a design firm from Kansas City, MO, was chosen by the Atlanta Braves as the architect of the new ball park. American Builders 2017, a joint venture, was selected as Construction Manager with Brasfield & Gorrie as the primary, and a groundbreaking ceremony was held on September 16, 2014. 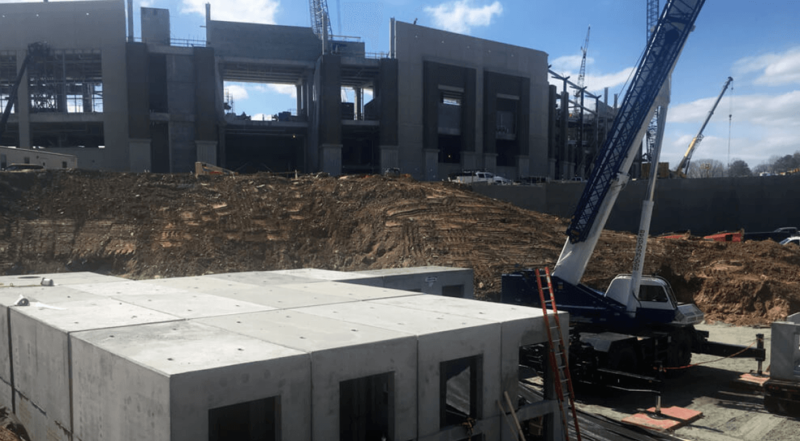 Simultaneously, just down the highway, the Mercedes-Benz Stadium was four months into construction and was grabbing local headlines and the interest of national contractors. Reide Onley, Senior Vice President of the Building Solutions team with CRH, had worked with Brasfield & Gorrie before, and, due to their existing business relationship, was able to discuss with them what was possible come production time with certain products. Doing so helped foster innovation and allowed everyone to work toward a common goal. Oldcastle APG, Oldcastle Infrastructure, and Oldcastle BuildingEnvelope® — all CRH Companies — contributed to the project, which is one of the largest stadiums in the U.S.
135,000 pieces of Trendstone and Trendstone Plus Architectural Block, and 300,000 pieces of Grey CMU block for the stadium construction. 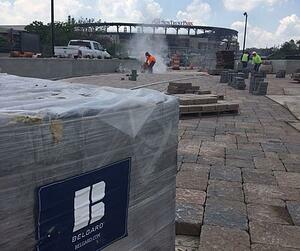 The plaza and walkways incorporated Belgard Pavers, specifically 7,750 square feet of Mega-Bergerac Pavers in Fossil Beige and 1,350 square feet of Holland Pavers in Gray Granite. While the size for the precast detention systems may have seemed expansive, the height of cover, compactness of space, and need for a 40% smaller footprint made other conventional detention systems impractical. Additionally, a cast-in place system would have added more than six weeks to the project timeline. Offering up to 1,260 cubic feet of storage per module, the StormCapture system retains rainwater runoff from the site for 24 hours, before slowly releasing it into the downstream stormwater system. “I don’t believe any other building product manufacturer or fabricator in North America could have produced the product quantity and quality during the given span of time,” Onley said. Additionally, a $400 million entertainment district named The Battery Atlanta was built around the field. The district includes a concert hall, retail, restaurants, and more, along with an Omni Hotel. The hotel, which was a 50-50 partnership between the hotel chain and the Braves, stands at 16 floors and has rooms that overlook the Park. Oldcastle BuildingEnvelope® provided 43,000 square feet of SunGuard architectural insulating glass and 1,000 square feet of Walker Velour glass for the hotel. The new Omni hotel opened in early January 2018, and the new 15-acre stadium held its first regular season game on April 14, 2017 against the San Diego Padres. Finished just 29 months after breaking ground, the stadium has over 41,000 seats designed in a more “intimate” configuration than other ballparks. According to Onley, one reason this stadium project was a success is because of the relationships and the people on the job. There are many ways that we can help you make the perfect project a reality. Learn more about which products to choose to achieve responsible stormwater management by downloading our Guide to Stormwater Management eBook.